£18 to £39.50 (Book early to get your favourite seats at the best price). Presented by arrangement with Music Theatre International (Europe) Limited. We’re excited to announce Storyhouse’s big summer show of 2019 to celebrate the building’s second birthday! 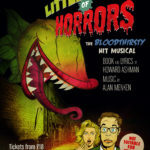 Little Shop of Horrors is the latest show to be produced by Storyhouse and will feature the creative talent of Olivier award-winning director and choreographer Stephen Mear (Gypsy, starring Imelda Staunton, West End’s Mary Poppins with Sir Matthew Bourne). A limited number of £7 tickets are available for Under 26s on Wednesdays and Thursdays. Over 60s can get 20% off on Sunday afternoon performances. Schools and group discounts available, get in touch to book your tickets. Cameron Mackintosh and the Shubert Organisation. This is a Made by Storyhouse production. We proudly present the first ever Storyhouse Cabaret – an evening of sparkling variety and cabaret, put together exclusively for Storyhouse by the great Mat Ricardo!